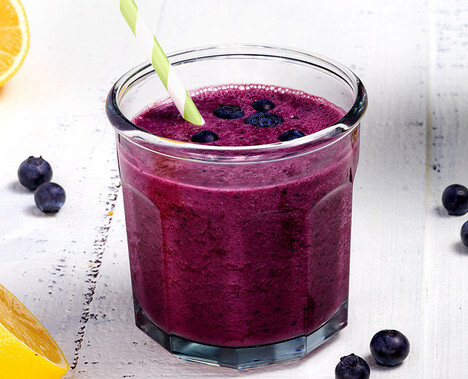 Try this refreshing smoothie for breakfast or an afternoon snack! Remove all zest from the lemon, set aside. Slice the lemon in half and squeeze the juice from half of the lemon into blender. Add the blueberries, yogurt and lemon zest. Blend until smooth. Tip: To freeze fresh berries: rinse berries, towel dry and then spread out onto a cookie sheet lined with plastic wrap or waxed paper. Freeze for at least 30 minutes before adding to smoothie. Once frozen, berries can be stored in a plastic freezer bag.